Using the fragment position in a fragment shader is quite useful, but it is far from the best tool for controlling the color of triangles. A much more useful tool is to give each vertex a color explicitly. The Vertex Colors tutorial implements this; the main file for this tutorial is VertexColors.cpp. We want to affect the data being passed through the system. The sequence of events we want to happen is as follows. For every position that we pass to a vertex shader, we want to pass a corresponding color value. 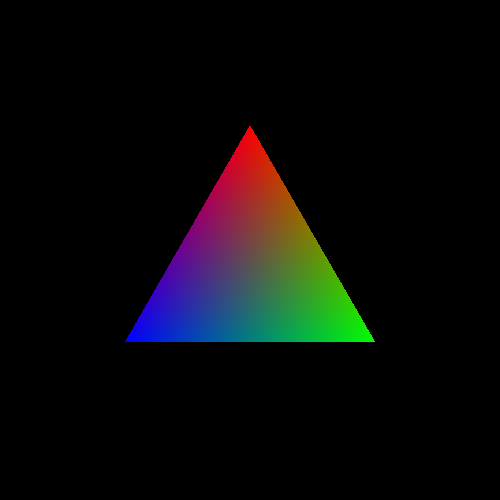 For every output position in the vertex shader, we also want to output a color value that is the same as the input color value the vertex shader received. In the fragment shader, we want to receive an input color from the vertex shader and use that as the output color of that fragment. You most likely have some serious questions about that sequence of events, notably about how steps 2 and 3 could possibly work. We'll get to that. We will follow the revised flow of data through the OpenGL pipeline. First, we need to understand what arrays of data look like at the lowest level. A single byte is the smallest addressible data in C/C++. A byte represents 8 bits (a bit can be 0 or 1), and it is a number on the range [0, 255]. A value of type float requires 4 bytes worth of storage. Any float value is stored in 4 consecutive bytes of memory. A sequence of 4 floats, in GLSL parlance a vec4, is exactly that: a sequence of four floating-point values. Therefore, a vec4 takes up 16 bytes, 4 floats times the size of a float. The vertexData variable is one large array of floats. The way we want to use it however is as two arrays. Each 4 floats is a single vec4, and the first three vec4s represents the positions. The next 3 are the colors for the corresponding vertices. The top two show the layout of the basic data types, and each box is a byte. The bottom diagram shows the layout of the entire array, and each box is a float. The left half of the box represents the positions and the right half represents the colors. The code has not changed, because the size of the array is computed by the compiler with the sizeof directive. Since we added a few elements to the buffer, the computed size naturally grows bigger. Also, you may notice that the positions are different from prior tutorials. The original triangle, and the one that was used in the Fragment Position code, was a right triangle (one of the angles of the triangle is 90 degrees) that was isosceles (two of its three sides are the same length). This new triangle is an equilateral triangle (all three sides are the same length) centered at the origin. Recall from above that we are sending two pieces of data per-vertex: a position and a color. We have two arrays, one for each piece of data. They may happen to be adjacent to one another in memory, but this changes nothing; there are two arrays of data. We need to tell OpenGL how to get each of these pieces of data. Since we have two pieces of data, we have two vertex attributes. For each attribute, we must call glEnableVertexAttribArray to enable that particular attribute. The first parameter is the attribute location set by the layout(location) field for that attribute in the vertex shader. Then, we call glVertexAttribPointer for each of the attribute arrays we want to use. The only difference in the two calls are which attribute location to send the data to and the last parameter. The last parameter is the byte offset into the buffer of where the data for this attribute starts. This offset, in this case, is 4 (the size of a float) * 4 (the number of floats in a vec4) * 3 (the number of vec4's in the position data). If you're wondering why it is (void*)48 and not just 48, that is because of some legacy API cruft. The reason why the function name is glVertexAttrib“Pointer” is because the last parameter is technically a pointer to client memory. Or at least, it could be in the past. So we must explicitly cast the integer value 48 to a pointer type. After this, we use glDrawArrays to render, then disable the arrays with glDisableVertexAttribArray. In the last tutorial, we skimmed over the details of what exactly glDrawArrays does. Let us take a closer look now. Each element of the positionAttribArray contains 4 components, the size of our input to the vertex shader (vec4). This is the case because the second parameter of glVertexAttribPointer is 4. Each component is a floating-point number; similarly because the third parameter is GL_FLOAT. The array takes its data from bufferObject because this was the buffer object that was bound at the time that glVertexAttribPointer was called. And the offset from the beginning of the buffer object is 0 because that is the last parameter of glVertexAttribPointer. The same goes for colorAttribArray, except for the offset value, which is 48 bytes. This means that the vertex shader will be executed count times, and it will be given data beginning with the start-th element and continuing for count elements. So the first time the vertex shader gets run, it takes the position attribute from bufferObject[0 + (0 * 4 * sizeof(float))] and the color attribute from bufferObject[48 + (0 * 4 * sizeof(float))]. The second time pulls the position from bufferObject[0 + (1 * 4 * sizeof(float))] and color from bufferObject[48 + (1 * 4 * sizeof(float))]. And so on. As before, every 3 vertices processed are transformed into a triangle. There are three new lines here. Let us take them one at a time. The declaration of the global color defines a new input for the vertex shader. So this shader, in addition to taking an input named position also takes a second input named color. As with the position input, this tutorial assigns each attribute to an attribute index. position is assigned the attribute index 0, while color is assigned 1. That much only gets the data into the vertex shader. We want to pass this data out of the vertex shader. To do this, we must define an output variable. This is done using the out keyword. In this case, the output variable is called theColor and is of type vec4. The smooth keyword is an interpolation qualifier. We will see what this means a bit later. Of course, this simply defines the output variable. In main, we actually write to it, assigning to it the value of color that was given as a vertex attribute. This being shader code, we could have used some other heuristic or arbitrary algorithm to compute the color. But for the purpose of this tutorial, it is simply passing the value of an attribute passed to the vertex shader. Technically, the built-in variable gl_Position is defined as out vec4 gl_Position. So it is an output variable as well. It is a special output because this value is directly used by the system, rather than used only by shaders. User-defined outputs, like theColor above, have no intrinsic meaning to the system. They only have an effect in so far as other shader stages use them, as we will see next. This fragment shader defines an input variable. It is no coincidence that this input variable is named and typed the same as the output variable from the vertex shader. We are trying to feed information from the vertex shader to the fragment shader. To do this, OpenGL requires that the output from the previous stage have the same name and type as the input to the next stage. It also must use the same interpolation qualifier; if the vertex shader used smooth, the fragment shader must do the same. This is a good part of the reason why OpenGL requires vertex and fragment shaders to be linked together; if the names, types, or interpolation qualifiers do not match, then OpenGL will raise an error when the program is linked. So the fragment shader receives the value output from the vertex shader. The shader simply takes this value and copies it to the output. Thus, the color of each fragment will simply be whatever the vertex shader passed along. Now we come to the elephant in the room, so to speak. There is a basic communication problem. See, our vertex shader is run only 3 times. This execution produces 3 output positions (gl_Position) and 3 output colors (theColor). The 3 positions are used to construct and rasterize a triangle, producing a number of fragments. The fragment shader is not run 3 times. It is run once for every fragment produced by the rasterizer for this triangle. The number of fragments produced by a triangle depends on the viewing resolution and how much area of the screen the triangle covers. An equilateral triangle the length of who's sides are 1 has an area of ~0.433. The total screen area (on the range [-1, 1] in X and Y) is 4, so our triangle covers approximately one-tenth of the screen. The window's natural resolution is 500x500 pixels. 500*500 is 250,000 pixels; one-tenth of this is 25,000. So our fragment shader gets executed about 25,000 times. There's a slight disparity here. If the vertex shader is directly communicating with the fragment shader, and the vertex shader is outputting only 3 total color values, where do the other 24,997 values come from? The answer is fragment interpolation. By using the interpolation qualifier smooth when defining the vertex output and fragment input, we are telling OpenGL to do something special with this value. Instead of each fragment receiving one value from a single vertex, what each fragment gets is a blend between the three output values over the surface of the triangle. The closer the fragment is to one vertex, the more that vertex's output contributes to the value that the fragment program receives. Because such interpolation is by far the most common mode for communicating between the vertex shader and the fragment shader, if you do not provide an interpolation keyword, smooth will be used by default. There are two other alternatives: noperspective and flat. If you were to modify the tutorial and change smooth to noperspective, you would see no change. That does not mean a change did not happen; our example is just too simple for there to actually be a change. The difference between smooth and noperspective is somewhat subtle, and only matters once we start using more concrete examples. We will discuss this difference later. Each rasterized triangle has its own set of 3 outputs that are interpolated to compute the value for the fragments created by that triangle. So if you render 2 triangles, the interpolated values from one triangle do not directly affect the interpolated values from another triangle. Thus, each triangle can be taken independently from the rest. It is possible, and highly desirable in many cases, to build multiple triangles from shared vertices and vertex data. But we will discuss this at a later time. When you run the tutorial, you will get the following image. The colors at each tip of the triangle are the pure red, green, and blue colors. They blend together towards the center of the triangle.